'Kentucky Thoroughbred' ( William Bruner, R. 2002). Seedling 98-5. LA (TET), 33" (84 cm), Midseason late bloom. Standards violet blue (RHS 93B); style arms yellow, brushed and streaked lavender; Falls darker violet blue (89B), thin yellow halo, sunburst signal yellow with forked yellow orange midline; pronounced spicy fragrance. 'Professor Barbara' X JM3-85-chimera: ( 'Katherine L. Cornay' x 'Mentida'). Iris City 2006. 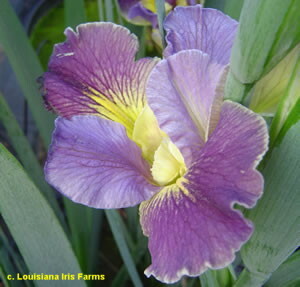 From Iris City Gardens catalog 2016: KENTUCKY THOROUGHBRED (Bruner 2006) HM 09 33" MLl 8.00. Tetraploid. Standards violet blue, style arms yellow, brushed and streaked lavender. Falls darker violet blue, thin yellow halo, sunburst signal yellow with forked yellow orange midline. Pronounced spicy fragrance.